There is no question that something very BIG is going down in Saudi Arabia. Two princes have already been killed; one in a helicopter crash and the other after he drew his weapon allegedly resisting arrest. The inside story on the ‘crash’ is that the Saudi Air Force shot down the copter to prevent a fleeing royal from leaving the country. These things just don’t happen unless there is a major counter-coup in the works. The original coup occurred in April of 2015 and first counter-coup played out back in September of 2015. Just how convoluted is this ongoing series of coups and attempted counter-coups? Everything that is now occurring in the Kingdom of Saudi Arabia (KSA) revolves around one man…and it’s not King Salman. The domestic and international affairs of KSA revolve around his son, Crown Prince Mohammed bin Salman. The Crown Prince of Saudi Arabia — Mohammad bin Salman — is also the current Minister of Defense. The following short bio provides more detailed info about the future monarch. Mohammad bin Salman bin Abdulaziz Al Saud (Arabic: محمد بن سلمان بن عبدالعزيز آل سعود‎‎; born 31 August 1985), also known as MBS, is the Crown Prince of Saudi Arabia, First Deputy Prime Minister of Saudi Arabia and the youngest minister of defense in the world. Mohammad bin Salman is also president of the Council for Economic and Development Affairs. He has been described as the power behind the throne of his father, King Salman. He was appointed Crown Prince in June 2017 following his father’s decision to remove Muhammad bin Nayef from all positions, making Mohammad bin Salman heir apparent to the throne. Ever since Mohammad bin Salman (MBS) assumed his various positions of power, all hell has broken loose in the kingdom, as well as throughout the Middle East. The engineered Yemen War, in particular, appears to be the pet project of the very young Minister of Defense. It also represents the greatest humanitarian crisis in the world today. The Middle East is now the site of the most dynamic and consequential moves and maneuvers on the global geopolitical chessboard. Saudi Arabia is now at the epicenter of the geopolitical earthquakes and international aftershocks. What is transpiring in Saudi Arabia and Yemen, Syria and Iraq, Qatar and Lebanon, Palestine and Israel will determine the ultimate success or failure of the ongoing Greater Israel Project. The final outcomes in the Northern Levant will especially reflect the degree to which the Modern State of Israel will dominate the Mideast. What is now indisputable is that the ascension of King Salman was the result of a MOSSAD-directed coup. In this way the illegitimate heir — Crown Prince Mohammad bin Salman — a close friend of Israel (some have conjectured that MBS is a MOSSAD asset) would eventually become king. He’s already making waves by establishing a much closer relationship with Israel. In fact, everything that’s taking place in the Middle East today is occurring in the interest of advancing the Greater Israel Project. Israel, of course, is ruled by the arch-Zionist Ashkenazis who emigrated from Europe post World War II. Saudi Arabia is ruled by the House of Saud, a crypto-Jewish family that the stole the kingdom from the rightful Arabian Bedouin heirs. The following 3 exposés authoritatively delineates the historical theft of Saudi Arabia, as well as who the co-conspirators were operating behind the scenes. As unbelievable as this may sound, the actions of Saudi Arabia over the past 50 years clearly indicate they are pro-Israel to the extreme, and even to the detriment of their neighboring Muslim countries. The Shiite-dominated nations such as Iran can attest to this ever-worsening state of affairs. This is where things get very complicated. The HARVEST massacre on October 1st in Las Vegas has been the most complex and inscrutable ‘false flag’ operation in U.S. history. SOTN was the first to label the mass shooting “a false flag within a false flag which was actually part hoax and part reality”. This CIA-directed psyop was also executed by rogue elements within the U.S. Intelligence Community who are relentless in their efforts to overthrow the Trump Administration. As always, this extremely purposeful psyop was specifically designed to distract the American people from the Democrat’s exploding “Uranium One” scandal. The fake Russia-Trump collusion story was, in fact, concocted because the Democrats knew they had to muddy the waters. The DNC did not expect Trump to win last November; Deep State also knew that President Trump was privy to the entirety of Uraniumgate. Hence, the Deep State Democrats resolved themselves to associate Team Trump with Russia collusion when it was the Clinton Crime Family, the DNC and the Soros Money Machine who were really the guilty parties. Quite incredibly, the only explanation that describes what really happened in Vegas is a full-blown Saudi counter-coup … coupled with a C.I.A. black op … together with an FBI entrapment scheme … and ending with a massive convoluted cover-up that continues to fall apart by the day. At the very heart of all of these various black operations, burgeoning scandals, and false flag attacks is one of the most egregious betrayals ever to occur in the American Republic that was perpetrated by the Obama Administration—Uraniumgate. The U.S. government under Obama, especially with the assistance of Secretary of State Hillary Clinton, is also guilty of high treason and ongoing sedition, as well as premeditated genocide, calculated war crimes, and other crimes against humanity. What really happened in Vegas can only be pieced together by the various whistleblower accounts that are slowly being posted on the Internet. Because of the many established Saudi connections which clearly existed on that October 1st Sunday evening, everything points to a bona-fide remote counter-coup implemented by the anti-MBS camp in Saudi Arabia. 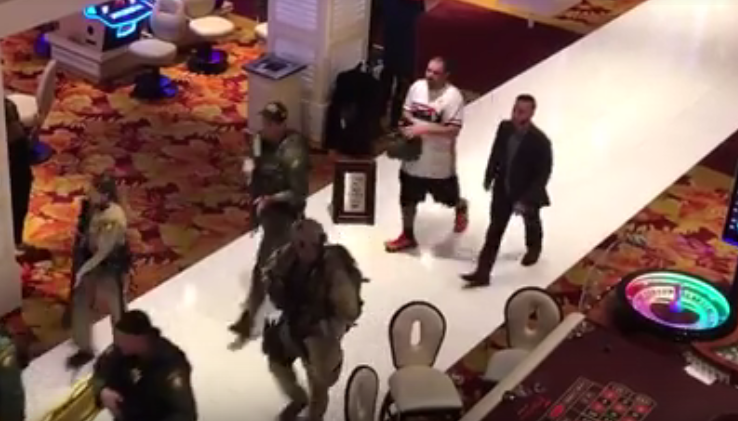 If the excellent photographic evidence that purports to show MBS being escorted out of the Tropicana Hotel by a SWAT team, then “bingo”, this whole story makes perfect sense. The man in the black shorts and white V-neck is obviously being escorted and had short notice to vacate the premises. What follows is the video from which the preceding photo was taken from. A forensic analysis of the video will conclusively reveal if the gentlemen in shorts is actually MBS. Now take a closer look at the SWAT team member at point with the yellow shirt carrying the unusual weapon. The single most important part of this plot concerns MBS, the Crown Prince. That he is being protected by an IDF-MOSSAD operative certainly presents a critical issue. Has MBS been flipped by the POTUS? Before the election, Candidate Trump was quite vocal about Saudi Arabian involvement in the 9/11 terrorist attacks. He was set on exposing it. After Inauguration Day President Trump does the biggest arms deal in memory with the Saudi regime. Then he backs the monarchy’s harsh provocations against Qatar. Trump had also signed off on a military operation inside of Yemen earlier this year. What’s really going on here? 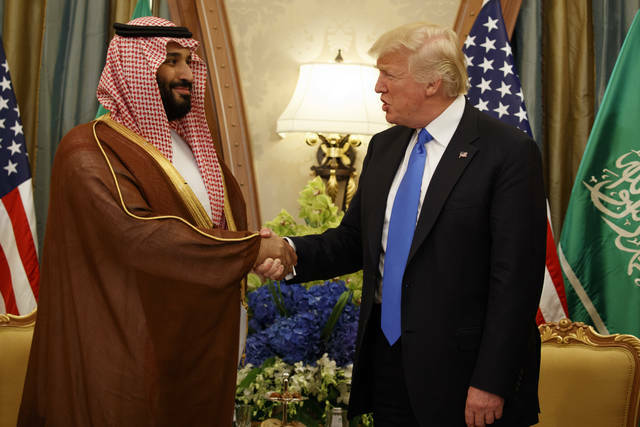 Has MBS since been flipped by Trump to cease and desist all funding and arming of ISIS? Is MBS operating in a strict survival mode; for his failure to follow Trump’s lead will expose the KSA ruling monarchy to the wrath of America for its complicity in the terror attacks on September 11, 2001. This whole story only gets more complicated by the day. 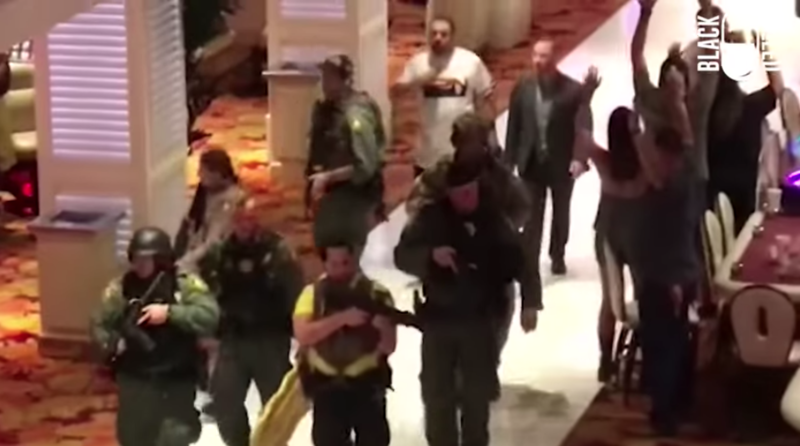 While a full-blown counter-coup did take place in Las Vegas on October 1, so did a [PREMEDITATED] massacre of the C&W patriots who attended the HARVEST. However, those who participated in the Saudi counter coup had nothing to do with the carnage at the HARVEST music festival. How to reconcile these two simultaneous dramas is the real challenge for every armchair investigator and deep researcher. Actually, the actual back story may look more like a false flag within a false flag conducted simultaneously with a 3rd false flag. Furthermore, each of these may have been part hoax (e.g. crisis actors) blended with obvious elements of reality (i.e. many people really died or were gravely wounded). The resulting cloud of confusion from these various plots and sub-plots was supposed to guarantee that the very real sneak attack on the conservative concert-goers would elude detection. The ultimate effect would be to so intimidate the Right that they would not feel safe gathering together in public spaces anymore. The threat of more terror attacks would hang over their collective heads like the Sword of Damocles. In this way, the Trump movement would be hindered and its future initiatives stymied. The crucial point here is that the Saudi counter coup is being aggressively disseminated — via the Alt Media — in order to present the false appearance of ‘collateral damage’ at the HARVEST. Again, unless they were MOSSAD agents who made up the MBS assassination team, Saudis would never risk being caught killing Americans after 9/11. It ought to be very clear by now that the 58 killed and 546 injured at the “Mandalay Massacre” were NOT collateral damage. They were the victims of a highly coordinated false flag attack on the Patriot Movement. That stealth attack was the result of the clandestine war that is being commandeered by George Soros & Company. The agents of Deep State are attacking the Patriot Movement in a surreptitious manner until the Bolshevik cowards feel safe enough to come out into the open. They didn’t even show up to protest on their scheduled “regime change” day that was set for this past November 4th. Who, then, can we say is floating this patently fake piece of the overall Saudi story, which seems to be quite accurate? And exactly why? For President Trump to tweet the following 2 messages speaks volumes about where he’s at with the present Saudi rulers. The real coup here then is the US government reining in an out-of-control Wahhabi monarchy and citizenry. Only time will tell about this seeming diplomatic victory for Trump. Nevertheless, it’s the covert Israeli connection that is quite worrisome. How do the Vegas massacre and the Saudi “Purge” connect?